When it is deployed it will be the first "purely artistic" object in space that does not have any military, commercial or scientific interest. However, the partial US government shutdown from 22 December 2018 to 25 January 2019 means that the artwork has not yet been released. Instead it has been travelling in the earth's low orbit unactivated for three months. A brick-sized box containing the inflatable artwork was launched into the earth's low orbit on 3 December 2018 as part of a greater load of 64 satellites on Elon Musk's SpaceX Falcon 9 rocket. Paglen's collaborators on the project, Nevada Museum of Art, require the go-ahead from the Federal Communications Commission (FCC) to deploy the artwork. In a statement written during the US governmental shutdown, the museum explained that they were unable to receive the go-ahead from the government department. The partial shutdown also affected the Smithsonian museums, including the Cooper Hewitt design museum in New York, which was forced to close temporarily in January, with staff left unpaid. Nevada Museum of Art has since told Dezeen that currently there is no way of knowing when deployment of the satellite will be approved and whether the satellite will be able to withstand the wait. "In spite of the government's being reopen, this still holds true. Unfortunately, that delay impacted us more than we thought it would," Nevada Museum of Art's Amanda Horn told Dezeen. Once deployed, the diamond-shaped art object will open out to approximately the size of a basketball court. The interior of the balloon is coated with titanium oxide. "Reflective titanium dioxide powder coats the inside of the sculpture, so that sunlight reflects off of it, making it visible from earth with the naked eye — like a slowly moving artificial star as bright as a star in the Big Dipper," said the museum. The art object is designed to travel around the earth's orbit for a couple of months, appearing to onlookers as a bright star in the night sky, before dissolving into the atmosphere. 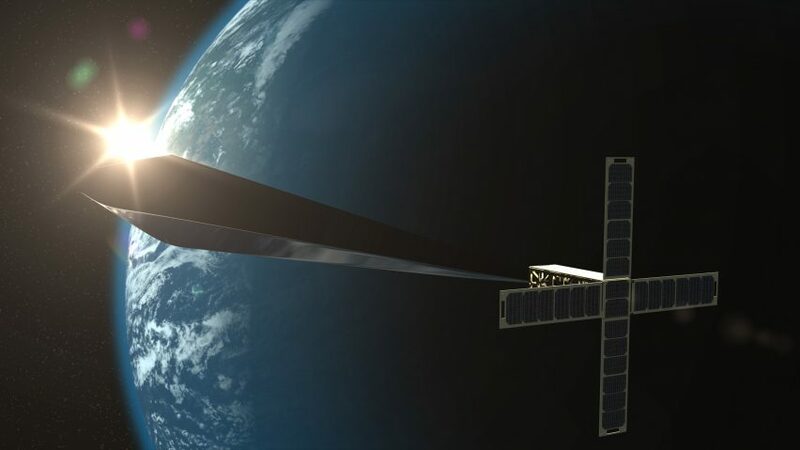 "Trevor Paglin's Orbital Reflector is the first satellite to launch into earth's low orbit purely as an artistic gesture. It is in many ways the opposite of every other satellite placed into orbit," said the Nevada Museum of Art, which collaborated with the artist on the project. In the meantime, an exhibition about the project at the Nevada Museum of Art takes place until 12 May 2019. In a similar attempt to light up the night sky, New Zealand-based aerospace startup Rocket Lab secretly launched an artificial star into orbit last year.